The BART extension to San Francisco International Airport is a story riddled with controversy. The project was ultimately preferred over a Caltrain extension to downtown, despite what seemed to be overwhelming support for Caltrain in the late 1980s. Both projects posed a solution to a worsening problem on the Peninsula: gridlock. A key player in this story is California state senator Quentin Kopp, who has largely focused on Bay Area transportation throughout his entire career. His pro-Caltrain anti-BART stance took a mysterious U-turn in the early 90s, and his subsequent pro-BART efforts pushed the vision to fruition. Today, the Peninsula is left with a faulty transit system whose need for upgrades and strange configuration will continue to cause inconvenience for years to come. In June of 2003, Bay Area Rapid Transit (BART) opened a new rail line extending from its old southern terminus in Colma to a station at San Francisco International Airport (SFO). The following year, the American Public Transportation Association named BART the #1 Transit System in America providing over 30 million passenger trips per year. (BART Timeline, 2014) This honor would surprise the average San Francisco resident today, by contrast, whose complaints about BART and about San Francisco’s public transit system as a whole are frequent. South Peninsula travelers not within walking distance of the Caltrain, for example, can’t get to SFO for under $30 without riding four separate vessels: a ride to a Caltrain station, the Caltrain, BART, and Airtrain to their terminal. A personal taxi from Palo Alto, for comparison, is typically $45 to $50, each way. Why is the system like this? It is easy to take our transportation infrastructure for granted. You ride the same train to work every day, hardly giving a thought to how that train got there. Why weren’t the tracks made one street over? Why is the station three blocks away from work instead of two? When will the system change again? Why doesn’t the Caltrain go all the way downtown? Completion of both projects would raise San Francisco’s transportation system to a level comparable to that of major European cities. (Demoro, Jun. 9 1988) State and Federal government could not fund both at the same time because having both projects under construction simultaneously would be inefficient. They would not provide the funds they pledged until local governments ensure those funds would be matched. The 1988 sales tax vote, along with toll bridge increases, did just that. (Demoro, Nov. 10, 1988) Even though Caltrain seemed to have stronger support from both officials and transportation experts, BART ultimately received funding first, and therefore finished first. Mysterious is the manner in which favor shifted from Caltrain to BART. Former California State Senator Quentin Kopp (held office 1986-1998), whose legacy includes helping the BART extension come to reality during his term, publicly and firmly voiced his support of Caltrain’s vision in a 1987 article in the San Francisco Chronicle. He also bashed BART’s plan. “I unequivocally predict that should [BART’s extension] ever be effectuated, it will be a debilitating money loser and a system which produces little usage by airline passengers or airport employees,” he wrote in the article, titled Extending Caltrain is Top Priority. (Kopp, 1987) In 1992, both extensions appeared as measures on the ballot in San Mateo, and while the measures weren’t supposed to be pitted against each other, officials were backing one or the other, because everyone knew that it had to be one or the other. (Workman, 7 Oct. 1992) Neither measure included a cost analysis. Both measures passed, but Caltrain received more votes. (Yates, 22 Jun. 2005) Election statistics could not be found. Quentin Kopp, left of the man with the walker. His criticism of the BART project in 1987 was twofold; it was too early in the development phase to be a timely solution to the Peninsula’s gridlock problem, and the station wouldn’t even be at the airport. “It would be to a wasteland west of the Bayshore and approximately a mile and one half from the airline terminals,” he wrote. Kopp’s chief contribution to the BART extension was starting a grassroots effort to get Measure I on San Francisco ballots in 1994. (Cabanatuan, 21 Jun. 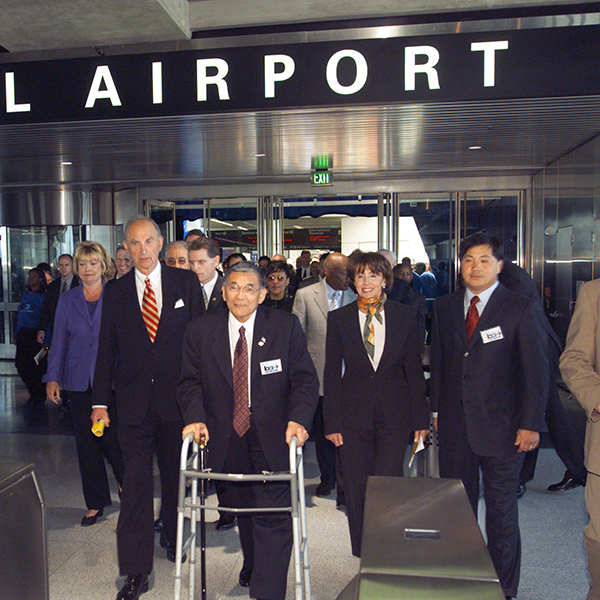 2003) The measure advocated for a station next to the international terminal, where it is today, instead of in this “wasteland.” SFO and its airlines did not want the station to occupy airport property and demanded that BART pay a hefty rent equivalent to $4m per year. (Cabanatuan, 21 Jun. 2003). BART and the airlines reached an agreement, with the help of Kopp. Literature on Kopp’s stance, between the time of his scathing review of BART and when he helped push the project through in 1994, is scarce. The tone of Kopp’s argument does not suggest that he would have been willing to change sides even if the location of the station were better. But as the history says, he did switch, with emphasis. Convincing the airlines to agree to the project was the final key to gaining a $750 million promise from the White House, which would get paid out in annual amounts earned through lobbying with the Department of Transportation. Kopp, in his pro-Caltrain anti-BART statement, insisted the project would take 20 to 30 years after 1987 to complete, because it had too many financial and political hoops to jump through. (Kopp, 1987) Kopp switched sides and helped the project through those hoops. It took 16 years. Bechtel Corporation, who built all of BART’s rails, built this one too, and continues to receive contracts for multimillion dollar extensions. Today we are left with a BART system fraught with delays, and growing more obsolete day by day; populations continue to grow and BART’s cars are overcrowded. (Terplan and Warburg, 12 Dec. 2014) To catch up to growing populations and the rapidly changing energy market, another investment upwards of several hundred million dollars is on the horizon. It is an interesting thought experiment, wondering what San Francisco would look like today had Kopp not changed his mind, or if the AirTrain extension option were considered more thoroughly. Would BART-to-SFO still have been constructed before Caltrain-to-downtown? Baldassari, Erin. "BART: Customer Satisfaction at 20-year Low." The Mercury News, 26 Jan. 2017. Web. 4 Mar. 2017. Barmann, Jay.“Rail Extension From Caltrain To New Transit Center Likely Won't Open Until 2026 (If Then).” SFist, 7 Nov. 2016. Accessed 5 Mar. 2017. "BART: A Historical Timeline." (pdf) (n.d.): n. pag. Web. 4 Mar. 2017. BART Ridership Data from 2002 and 2003. 2003. Raw data. BART website, San Francisco, CA. Cabanatuan, Michael. “BART’s customer satisfaction at all-time low, surprising no one.” THE SAN FRANCISCO CHRONICLE, 25 Jan. 2017, FINAL, BAY AREA. Online. Accessed 05 Mar. 2017. Cabanatuan, Michael. "EXTENSION'S HISTORY FULL OF OBSTACLES - BART tracks overcame bickering, wet weather, endangered snakes." SAN FRANCISCO CHRONICLE, 21 Jun. 2003, FINAL, BAY AREA, p. A13. NewsBank. Accessed 05 Mar. 2017. Cabanatuan, Michael. "BART GETS DOWN TO BUSINESS - Traffic smooth, light along new 8.7-mile extension." SAN FRANCISCO CHRONICLE, 24 Jun. 2003, FINAL, NEWS, p. A15. NewsBank. Accessed 20 Mar. 2017. "Convenient SFO-Train Connection Being Derailed?" Convenient SFO-Train Connection Being Derailed? Bay Rail Alliance, Summer 1996. Web. 05 Mar. 2017. Demoro, Harre W. "Bay Area Voters OK Financing For Vast Transit Improvements." SAN FRANCISCO CHRONICLE, 10 Nov. 1988, FINAL, NEWS, p. A12. NewsBank. Accessed 05 Mar. 2017. Demoro, Harre W. "What the San Mateo Vote Means to Bay Commuters." SAN FRANCISCO CHRONICLE, 9 Jun. 1988, FINAL, NEWS, p. A11. NewsBank. Accessed 05 Mar. 2017. Eskenazi, Joe. "Excess Baggage: The Forgotten Costs of the BART SFO Extension." SF Weekly, 03 Oct. 2013. Web. 05 Mar. 2017. Horgan, John. “Quentin Kopp vs. Jerry Hill and Caltrain.” SAN JOSE MERCURY NEWS, 24 Sep. 2013, FINAL, NEWS. Accessed 05 Mar. 2017. Hoover, Ken. "BART Board OKs Route to S.F. Airport - Now plan needs SamTrans' assent." SAN FRANCISCO CHRONICLE, 28 Apr. 1995, FINAL, NEWS, p. A1. NewsBank. Accessed 05 Mar. 2017. KOPP, QUENTIN. "Extending CalTrain Is Top Priority." SAN FRANCISCO CHRONICLE, 10 Oct. 1987, FINAL, EDITORIAL, p. A12. NewsBank. Accessed 4 Mar. 2017. Matier, Phillip. "BART line to SFO -- expectations way up, ridership way down." SAN FRANCISCO CHRONICLE, 9 Jul. 2003, FINAL, BAY AREA, p. A13. NewsBank. Accessed 05 Mar. 2017. Terplan, Egon, and Jennifer Warburg. “How Are the Bay Area's Biggest Cities Planning for Growth?” SPUR, 22 Mar. 2016. Accessed 20 Mar. 2017. “The Plan.” Projects, BART. Accessed 20 Mar. 2017. "Why is the Caltrain connection to SFO via BART so cumbersome?" BayRail Alliance. N.p., 24 Mar. 2013. Web. 05 Mar. 2017. Workman, Bill. "Transit Issues Stay on Ballot In San Mateo." SAN FRANCISCO CHRONICLE, 7 Oct. 1992, FINAL, NEWS, p. A20. NewsBank. Accessed 19 Mar. 2017. Yates, Dana. "Was BART really worth the cost?" San Mateo Daily Journal. N.p., 22 June 2005. Web. 5 Mar. 2017. Metropolitan Transportation Commission meeting notes from the 80s and 90s. These are located at their library in San Francisco and might provide further insight into the nuanced decision making undertaken with regards to BART and Caltrain. Countless articles from the San Francisco Chronicle covering transportation in the Bay Area. From the 80s and 90s, these can be found in databases like infoweb.newsbank.com. Background information on Bechtel Corp., the builders of BART, written before BART-to-SFO began. A recent story on Bechtel Corp from Forbes.